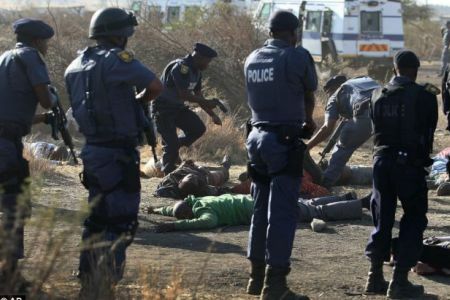 At least 30 people have been killed after South African police clashed with striking miners at Lonmin Marikana mine on Thursday, the police minister has said. According to witnesses, police opened fire on strikers armed mostly with clubs and machetes. The Lonmin-owned platinum mine has been at the centre of a violent pay dispute, exacerbated by tensions between two rival trade unions. Violence during the strike had already killed 10 people. The incident is one of the bloodiest police operations since the end of the apartheid in South Africa. Police were sent to intervene after several thousand miners gathered at Marikana, which lies about 100 km (62 miles) north-west of Johannesburg, to call for a pay rise of more than $1,000 a month. One witness, Molaole Montsho, of the South African news agency Sapa, said police had first used water cannon, tear gas and stun grenades in an attempt to break up the protest. “And then in the commotion – we were about 800 m (2,600 ft) from the scene – we heard gunshots that lasted for about two minutes,” he said. Police ministry spokesman Zweli Mnisi said an investigation into the incident had begun. Speaking on Thursday, President Jacob Zuma said he was “shocked and dismayed at this senseless violence”. “We call upon the labor movement and business to work with government to arrest the situation before it deteriorates any further,” he said.